Today, we will start with the offense and only project those players who are currently on campus. Transfer Jonah Jackson won’t be mentioned below because he is still at Rutgers, and none of the incoming freshmen will be included either. 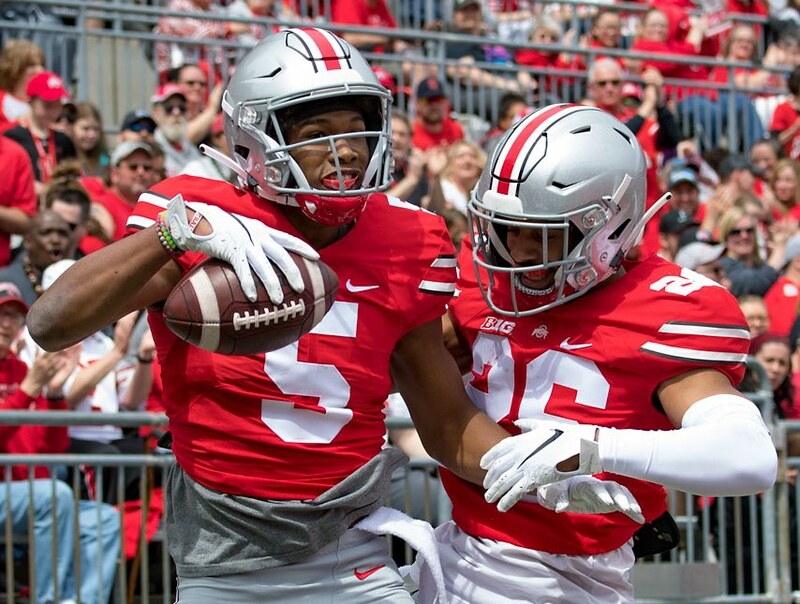 None of those incoming freshmen are expected to start anyway, so what follows is a pretty good idea of where things may be when the Buckeyes open the season in August against Florida Atlantic. From what we saw, Justin Fields was with the ones more than Matthew Baldwin this spring, so he is at the top here. Ohio State will look at adding a graduate transfer this spring if they have the room. Xavier Johnson is a walk-on, but merits mention here because of his play this spring. 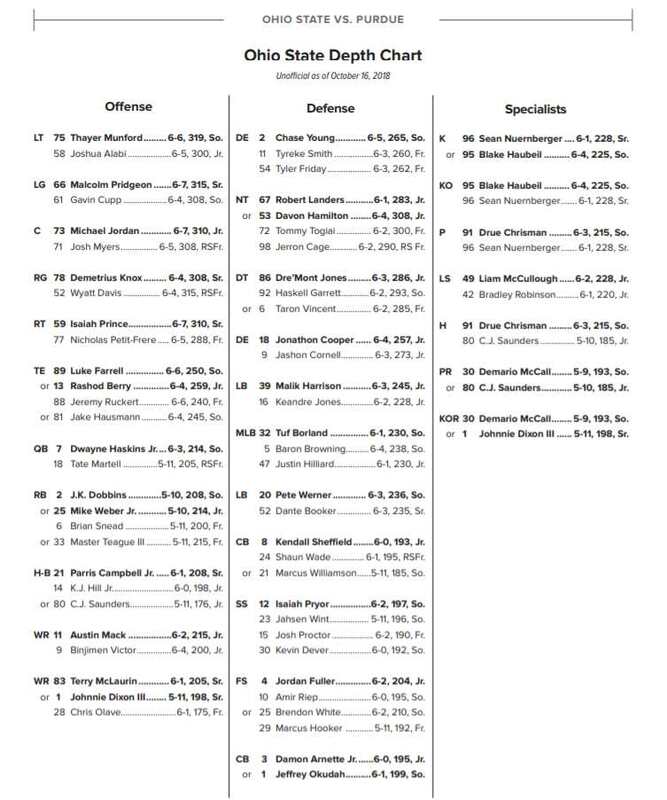 Not having Demario McCall this spring was unfortunate, but overall this is an unproven, yet deep and talented group. Enough with the ORs. It’s time for the ANDs. All three H-backs will be involved this season, just as they were this spring. It will be interesting to see if Austin Mack stays at Z in the fall or if they feel good with the Zs they have. Chris Olave missed the final week or so of spring practice with a minor injury, but he is fine. You all saw what Garrett Wilson has been doing in camp, and it was also good to see Ellijah Gardiner making plays in the spring game. Garyn Prater is a walk-on, but has made plays in camp. Jaylen Harris missed the last week, so we didn’t get to see him in the spring game. Binjimen Victor as a deep threat this season could be an interesting development. The tight ends have been outstanding all offseason. You didn’t get to see them as much as I thought you might in the spring game, but they will have a sizable role in the offense this season. Thayer Munford has been out with a back injury, which is a concern, though the coaches aren’t talking like it is. Ryan Day has always talked about Munford’s situation as if he’ll be fine in the fall. Josh Alabi and Kevin Woidke are both veterans. Alabi has played plenty, including in last season’s Rose Bowl. Branden Bowen could end up at guard or tackle and be very good wherever that may be. Fall camp will be interesting once Jonah Jackson arrives. Things are far from set yet on the offensive line. Greg Studrawa feels very good about the center position, so you should too. Wyatt Davis has been with the ones since December, so he should be fine. There were no complaints about him this spring. Nicholas Petit-Frere stayed at right tackle all spring because the coaches want him to be ready to win the position in the fall. Max Wray finally had his black stripe removed this spring after being held back by injury last year.